The secret to the 9 calorie holiday cookie you can afford to eat! This week (December 1-7) marks National Cookie Cutter Week and National Cookie Day (December 4). Yes, holiday baking season is indeed upon us! Unfortunately, the holidays can be a rather trying time for those watching their weight or those with diabetes or gluten sensitivity. You can take a couple different approaches: Eating moderately and exercising to compensate for the extra calories; or avoiding sweets entirely for instance. We'd like to suggest another tactic. Try these moist chocolate cookies made with Skinny Noodles Shirataki. At first, eating cookies made with Skinny Noodles might sound crazy, but these flourless cake-like cookies might just satisfy your sweet tooth and chocolate cravings. And with only 9 calories and 1.5g carbohydrates per gluten-free cookie, you can afford to eat more than one. If you're willing to add a few more calories, you can sprinkle these goodies with a few chopped hazelnuts or sliced almonds. You can even make your own Mini Skinny Whoopie Pies by placing a tablespoon of Sugar-Free Cool Whip between two of these Skinny Chocolate Cookies. This little holiday treat will cost you just 28 calories, 0.5g fat, and 3g of carbs. So sneak a little jolly into your happy, healthy holiday season! 0g fat, and <1g carbs per serving. 2. Open and rinse Skinny Noodles thoroughly with warm water in a strainer. Drain well. 3. In a large dry frying pan, cook Skinny Noodles on high heat. Stir frequently. 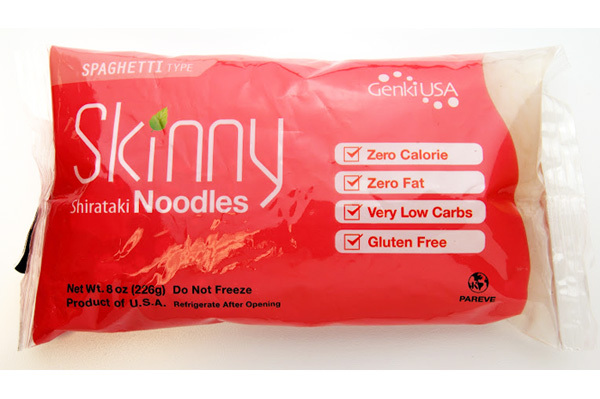 As Skinny Noodles begin to dry, they will "squeak," losing some transparency and shriveling a bit. Remove from heat. Let cool for 5 minutes. 4. Place dry, cooked Skinny Noodles in food processor and process for 2 minutes, or until noodles look similar to gel. 5. Add rest of ingredients. Process until well blended. Refrigerate mixture for 45-60 minutes. 6. Cover cookie sheet with tin foil and spray with non-stick cooking spray. Drop mixture by teaspoonfuls on to cookie sheet. Bake 10 minutes. Let cool 5 minutes and enjoy! Place 1 Tablespoon Sugar-Free Cool Whip between 2 Skinny Chocolate Cookies.